Do you ever pass by your local yoga studio, see rows of zen faces upside down in headstands, and think: "I'm not yogi enough?" 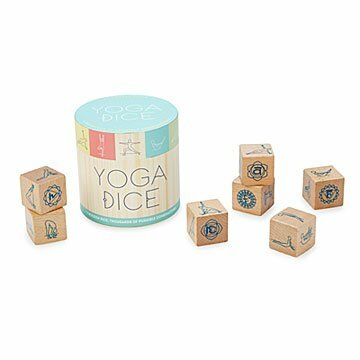 No matter what stage you are in your practice—from Master of the Wounded Peacock to Still Sorting Out Child's Pose—this set of dice makes posing fun and easy. Turn your living room or yard into an unintimidating practice space, roll, and slowly hold each pose for about six breaths. No matter what you land on, you'll work through the seven asana categories including sun salutation, standing, balancing, seated, forward bend, and core. It's an accessible way to deepen your experience and encourage the element of surprise. Made in the US. Wipe clean with a cloth if needed. The yoga-loving recipients were delighted with these. Roll the dice for your yoga positions. Fun and different idea for any yoga lover! Dice were a tad smaller than I anticipated but they are still great! Perfect Blocks for your Yoga Flow! These are a gift for my best friend. She's a yogi and is always looking for new ways to improve her yoga flow. I think the fun and spontaneity of rolling the dice and doing the suggested poses will be great for her. I use these when I want to take a quick break from the busy day. I like the booklet that comes with it and explains how to get into each pose and what the chakras mean. Very clever gift idea for those that love to do yoga! As stated above, our daughter wrote a thank you to us stating, "Great way to move my practice along, also simply adore the Company you ordered from; living wage and all recycled/recyclable materials!"